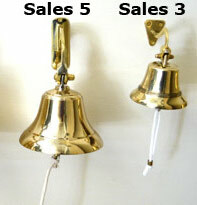 Our solid brass bells are found in salesrooms around the country, pealing forth whenever sales are made. This is a popular way to announce sales and to keep salespeople motivated. These are also used behind the bar, at track meets, or to call the kids for dinner. These are great wherever a small, attention-getting signal bell is needed. Pictured above are new solid brass bells, which come as shown with hanger and rope pull. We do not engrave these. Discounts given on quantity orders over 10 pieces; contact us for details. Shipping costs given are for 48 states only, and we will ship to Alaska and Hawaii. Sales 5 5" 3 lbs $59.00 $9.75 Click to hear. Sales 3 3.5" 1 lb $30.00 $9.75 Click to hear. Nautical Bell 5" 2 lbs $55.00 $9.75 Click to hear. 7" Chrome Bell 7" 3 lbs $75.00 $9.75 Click to hear.